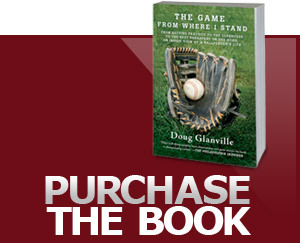 Former MLB player and ESPN analyst Doug Glanville will lead a discussion and hold a signing for his most recent book on Nov. 14, at 6 p.m. at the University of Saint Joseph in West Hartford. Hartford resident Doug Glanville made his name as a standout Major League baseball player. Over a nine-year career with the Phillies and Cubs, he won a reputation as an exceptional outfielder, at one point going almost 300 games in a row without committing an error. In 1999 Glanville batted .325 and was second in the league with 204 hits while stealing 34 bases – surely one of the most impressive statistical years ever to go unrewarded with an All-Star honor. Retiring in 2005, he has since worked an analyst and commentator for ESPN. "West Hartford had an ordinance that prohibits door-to-door solicitation. A man whom I allegedly resembled had broken this ordinance. Someone in West Hartford had called the police, and a young officer, believing he was doing his duty, had pursued the complaint to my street." While acknowledging that “our block would have been the first stop for the wayward shoveler if he had entered Hartford,” Glanville noted that “these practices have ‘side effects.’ They may help police find illegal drugs and guns, but they also disenfranchise untold numbers of people, making them feel like suspects … all of the time.” The incident spawned the memorable phrase, “Shoveling While Black,” coined by Glanville’s wife, Tiffany, in an email to their neighbor, state Rep. Matt Ritter, and reflecting the guilty-until-proven-innocent stigma that continues to plague so many African-Americans in their dealings with law enforcement. “In a sense,” Glanville summed up, "the shoveling incident was a painful reminder of something I’ve always known: My biggest challenge as a father will be to help my kids navigate a world where being black is both a source of pride and a reason for caution. I want them to have respect for the police, but also a healthy fear … But I also want them to go into the world with a firm sense of their own self-worth." Not satisfied with merely writing about the incident, he took action, collaborating with his Matt Ritter to craft a bill, signed into law in August 2015, prohibiting law enforcement from pursuing an offender outside the officer’s precinct if the suspicious activity in question is a relatively minor infraction. Since moving to Hartford five years ago, Doug and his wife Tiffany have been active in their community, sending their kids to Hartford public schools and working to bolster the quality of life in the city. Tiffany, a lawyer, serves on the Board of Education. Doug serves on the board of the MLB Players Alumni Association and runs a scholarship foundation he started to honor his late father, Dr. Cecil E. Glanville. A much sought-after writer and speaker, Doug Glanville is both entertaining and eloquent, a person uniquely qualified to discuss sports and the lessons they hold for life.